On September 5th, the members of both houses of Congress of the United States will clean the beach sand from between their toes and return to work. Our public servants who occupy The House of Representatives have been working on their respective tans since July 29th. The Senate has had a little less time in the sun; they held their final vote on August 3rd despite their pledge to stay until August 11th. Hopefully, they got a lot of rest, because they have a lot to do upon their return. By the end of September Congress will need to pass a budget bill to avoid a government shutdown. Expect Tea Party Republicans to hold their ground on spending cuts while Trump petitions for his wall. According to recent tweets, Trump is pushing for this fight and welcomes a government shutdown. Get out the popcorn this could get interesting. Washington also need to increase the debt ceiling, to avoid a debt default that could trigger a global financial crisis. Treasury Secretary Steven Mnuchin can pay the bills in full and on time through September 29th – after that, he will need an increase in the country’s $19.81 trillion-dollar credit limit. Republicans are promising that a default is impossible, but Congress also promised a repeal and replacement of Obamacare within the first 100 days of the Trump Presidency, and Trump himself guaranteed to kill the ACA on day one--so I wouldn’t hold my breath that increasing the nation’s credit limit will go any smoother. Congress also needs to reauthorize the insurance of 9 million children through the Children’s Health Insurance Program (CHIP) and pass the National Flood Insurance Program (NFIP)—Hurricane Harvey has put extra importance on this provision, as well as aid for the storm itself. After they take care of those urgent matters they plan to segue back to tax reform, infrastructure and to take yet another crack at making some needed modifications to Obamacare; before the premiums rise to 100% of disposable income. And they will have to juggle this full legislative agenda while dealing with North Korea, Russia-gate and Confederate Statue-gate. For a body of elected officials who have built their careers on doing nothing they have an enormous amount of legislation to sift through in an incredibly short amount of time. And all this dysfunction in DC is having an adverse effect on the dollar, which is already down over 9% this year. A strong dollar is emblematic of a vibrant economy. Whereas, the opposite displays faltering GDP growth and a distressed middle class. This recent retreat in the dollar is also due to Mario Draghi’s hint that he may pull back QE in the Eurozone. In their June meeting, The European Central Bank (ECB) failed to announce a policy change, but they did make some small changes to forward guidance, which has investors bracing for such an announcement at the September 7th meeting. Mr. Draghi has recently expressed more confidence in the Eurozone economy. The expectation of ECB tapering has put downward pressure on our dollar. This is why the lynchpin for the global economy now rests on the shoulders of Mario Draghi and Janet Yellen—both of whom foolishly believe that their massive counterfeiting sprees have put the global economy in a viable and stable condition. I intentionally left out Haruhiko Kuroda of the BOJ; even though he is the worst of the money printing bunch, at least he knows—along with everyone else--that he will never be able to stop counterfeiting yen. If the ECB begins the taper in January of next year, QE would be wound down to zero by June. And, of course, the Fed has made it clear that it will begin reverse QE around the end of this year. This will result in the selling of $50 billion worth of MBS and Treasuries at the same time the ECB is out of the additional bond-buying business. The memories of central bankers are extremely limited. In particular, Draghi forgets that before his pledge to do “whatever it takes” to push European bond yields lower during 2012, the German 10 year bund was 4%. And periphery yields such as; the Italian 10 year was close to 8%, Portugal 14%, and in Greece the yield was 40%. That is how high yields were before ECB purchases began. However, these intractable yields were extant before the gargantuan increase in nominal aggregate debt levels incurred since the global financial crisis, which was abetted by the central bank’s offering of negative borrowing rates. The central banks’ prescription for boosting the economy out of the Great Recession has been: print $15 trillion worth of fiat credit to purchase distressed bank assets, dramatically reduce debt service costs for both the public and private sectors, and to vastly inflate asset prices so as to create a trickle down wealth effect. But now, central banks are in the process of reversing that very same wealth effect that temporarily and artificially boosted global GDP. Therefore, by the middle of next year--at the very latest—we should experience unprecedented currency, equity and bond market chaos, which will be a trenchant change from today’s era of absent volatility. The vast majority of investors have fully embraced the passive buy and hold strategy due to confidence in governments and central banks. That misplaced confidence is the biggest bubble of all. CAMBRIDGE – Few economies pose as big a paradox as Mexico’s. Emerging from a series of macroeconomic crises in the mid-1990s, Mexico undertook bold reforms that should have put it on track for rapid economic growth. It embraced macroeconomic prudence, liberalized its economic policies, signed the North American Free Trade Agreement (NAFTA), invested in education, and implemented innovative policies to combat poverty. In many respects, these reforms paid off. Macroeconomic stability was achieved, domestic investment rose by two percentage points of GDP, and average educational attainment increased by nearly three years. Perhaps the most visible gains were on the external front. Exports jumped from 5% to 30% of GDP, and the GDP share of inward foreign direct investment tripled. But where it counts – in overall productivity and economic growth – the story is one of substantial disappointment. Since 1996, per capita economic growth has averaged well below 1.5%, and total factor productivity has stagnated or declined. If ever there was a country that was destined to be the poster child of the new orthodoxy in economic development, it was Mexico. Instead, the country fell behind even its Latin American peers. Why? A large part of the answer has to do with the Mexican economy’s extreme dualism – a problem that has been called the “two Mexicos.” The bulk of Mexican workers remain employed in “informal” firms – especially firms in which employees are not on salaried contracts – where productivity is a fraction of the level in large, modern firms that are integrated into the world economy. What is striking is that this dualism has worsened during the period of Mexico’s liberalizing reforms. Research by one of us (Levy) shows that informal firms have absorbed a growing share of the economy’s resources. The cumulative growth of employment between 1998 and 2013 in the informal sector was a whopping 115%, compared to 6% in the formal economy. For capital, cumulative growth was 134% for the informal sector and 9% for the formal sector. Mexico does not seem to lack economic dynamism. A considerable number of new firms are the main source of employment growth. But this churn does not seem to be of the kind that increases overall productivity. Evidence shows that many low-productivity firms survive, while high-productivity firms die. Productive heterogeneity, and the misallocation that goes with it, has been increasing in commerce, services, and manufacturing alike. As a result, the economy’s overall productivity has been stagnant or declining. It is not entirely clear why structural change has, perversely, reduced growth. One possible explanation is Mexico’s parallel system of social insurance. Firms and workers in the formal sector must pay for health insurance, pensions, and other employee benefits. But, because workers undervalue these benefits, the result is pure tax on formal employment. By contrast, when firms and workers are informal, workers receive a similar bundle of health and pension benefits for free. The result is that formal employment is unwittingly penalized, whereas informal employment is subsidized. Another possibility, which can accompany the first one, is that Mexico’s rapid opening to imports has bifurcated its economy between a relatively small number of technologically advanced, globally competitive winners, and a growing segment of firms, particularly in services and retail trade, that serve as the residual source of employment. In the absence of productive development policies of the type used in East Asia, modern firms may have not been able to expand rapidly enough. The beneficiaries of globalization are typically those countries that complemented it with a strategy to promote new activities, policies that favored the real economy over finance, and sequential reforms that emphasized high-productivity employment. Whichever of these stories is correct, it seems clear that Mexico’s growth problem is not the result of macroeconomic instability, the absence of foreign competition, or lack of human capital. In fact, returns to education have been falling partly because the supply of skilled workers has outpaced demand, as most informal firms do not require them. In the end, the effects of efficiency-minded reforms have been offset by factors – social insurance policies and market imperfections – that systematically channel too many resources to informal firms and create obstacles to formal firms. Given the inflammatory rhetoric of US President Donald Trump, discussion in Mexico is understandably revolving around the renegotiation of NAFTA. But if policymakers are to avoid missing the mark, after that process is completed, they must turn their attention to the structural factors that are depressing Mexico’s growth. There are two broad lessons here for other developing countries. First, for too long, these economies have been obsessed with opening to international trade, attracting foreign direct investment, liberalizing prices, and achieving macroeconomic stabilization. These reforms work, typically in conjunction with others, when they promote productivity-enhancing structural transformation. When they do not, or when other policies perversely counter them, the results will be disappointing. The second lesson is that countries need to pay close attention to how social insurance policies affect the behavior of firms and workers. Good intentions aside, the result may be that the low productivity segment of the economy is subsidized, while the high productivity segment is taxed. Mexico has shown that successful growth strategies cannot be built on ready-made blueprints. Rather, they require targeted, country-specific reforms that remove actual obstacles to the expansion of modern sectors, and social policies that are compatible with structural transformation. Who saw the global financial crisis coming, who didn’t and who deserved blame for the forecasting failure? After a decade of debating these questions, I wonder whether we shouldn’t be asking a different one: even if we had clearly seen the crisis coming, would it have made a difference? Perhaps — but perhaps not. Consider New Orleans in 2004. With a terrible hurricane bearing down on the city, officials realised that the situation was grim. The levees were in disrepair and a storm surge could flood the low-lying city. A hundred thousand residents would be unable to evacuate without help, and not enough help was available. A plan was hatched to evacuate families to the Superdome, a sports stadium, but managers there warned that it simply could not house so many. If only there had been more warning of disaster. Some readers will recall, though, that the catastrophe of Hurricane Katrina took place in 2005. The storm of 2004 was Hurricane Ivan, which, after lashing the Caribbean, weakened and turned aside from New Orleans. The city had been given almost a full year’s warning of the gaps in its defences. The near miss led to much discussion but little action. When Hurricane Katrina hit the city, evacuation proved as impractical and the Superdome as inadequate as had been expected. The levees broke in more than 50 places, and about 1,500 people died. New Orleans was gutted. It was an awful failure but surely not a failure of forecasting. Robert Meyer and Howard Kunreuther in The Ostrich Paradox argue that it is common for institutions and ordinary citizens to make poor decisions in the face of foreseeable natural disasters, sometimes with tragic results. There are many reasons for this, including corruption, perverse incentives or political expediency. But the authors focus on psychological explanations. They identify cognitive rules of thumb that normally work well but serve us poorly in preparing for extreme events. One such mental shortcut is what the authors term the “amnesia bias”, a tendency to focus on recent experience. We remember more distant catastrophes but we do not feel them viscerally. For example, many people bought flood insurance after watching the tragedy of Hurricane Katrina unfold, but within three years demand for flood insurance had fallen back to pre-Katrina levels. We cut the same cognitive corners in finance. There are many historical examples of manias and panics but, while most of us know something about the great crash of 1929, or the tulip mania of 1637, those events have no emotional heft. Even the dotcom bubble of 1999-2001, which should at least have reminded everyone that financial markets do not always give sensible price signals, failed to make much impact on how regulators and market participants behaved. Six years was long enough for the lesson to lose its sting. Another rule of thumb is “optimism bias”. We are often too optimistic, at least about our personal situation, even in the midst of a more generalised pessimism. In 1980, the psychologist Neil Weinstein published a study showing that people did not dwell on risks such as cancer or divorce. Yes, these things happen, Professor Weinstein’s subjects told him: they just won’t happen to me. The same tendency was on display as Hurricane Sandy closed in on New Jersey in 2012. Robert Meyer found that residents of Atlantic City reckoned that the chance of being hit was more than 80 per cent. That was too gloomy: the National Hurricane Center put it at 32 per cent. Yet few people had plans to evacuate, and even those who had storm shutters often had no intention of installing them. Surely even an optimist should have taken the precautions of installing the storm shutters? Why buy storm shutters if you do not erect them when a storm is coming? Messrs Meyer and Kunreuther point to “single action bias”: confronted with a worrying situation, taking one or two positive steps often feels enough. If you have already bought extra groceries and refuelled the family car, surely putting up cumbersome storm shutters is unnecessary? Reading the psychological literature on heuristics and bias sometimes makes one feel too pessimistic. We do not always blunder. Individuals can make smart decisions, whether confronted with a hurricane or a retirement savings account. Financial markets do not often lose their minds. If they did, active investment managers might find it a little easier to outperform the tracker funds. Governments, too, can learn lessons and erect barriers against future trouble. Still, because things often do work well, we forget. The old hands retire; bad memories lose their jolt; we grow cynical about false alarms. Yesterday’s prudence is today’s health-and-safety-gone-mad. Small wonder that, 10 years on, senior Federal Reserve official Stanley Fischer is having to warn against “extremely dangerous and extremely short-sighted” efforts to dismantle financial regulations. All of us, from time to time, prefer to stick our heads in the sand. An extended run of modest labor market gains this year has produced little acceleration in wage growth or inflation, underscoring a puzzle that complicates Federal Reserve policy decisions looming in the months ahead. Nonfarm payrolls rose a seasonally adjusted 156,000 in August, ​a modest slowdown from the prior two months, ​the Labor Department said Friday. When combined with June and July’s job growth, estimates of which were revised down, data show the economy still added jobs this summer at almost the exact pace that has prevailed since early 2016, a little more than 180,000 a month. The unemployment rate ticked​ up ​from a 16-year low to 4.4% and wages​ ​failed to break out, rising 2.5% from a year earlier for the fifth straight month. The U.S. economy expanded in the second quarter at a 3% annual rate, the Commerce Department said ​this week, but many economists and the Fed expect growth to come in just above 2% for the full year. Economic growth hasn’t topped 3% for a calendar year since 2005. The steady trend in hiring comes as some other measures of economic vitality perk up. 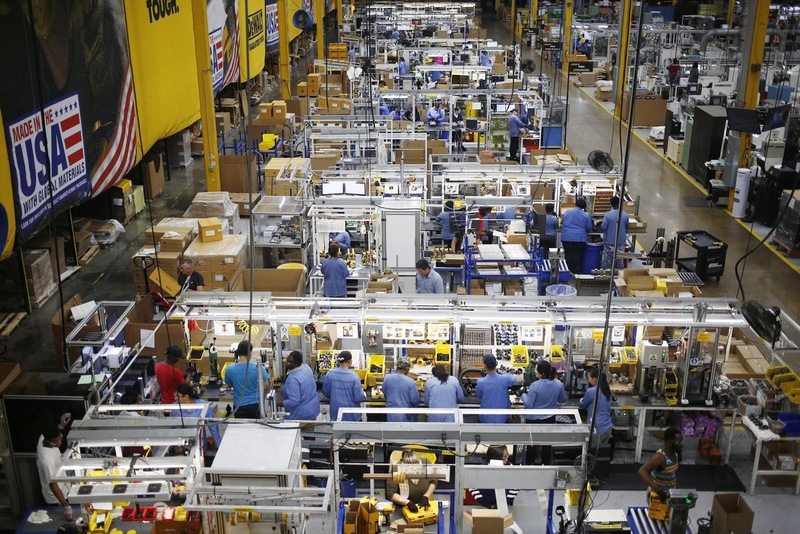 Factory activity hit its highest level in six years last month, the Institute for Supply Management said Friday. That coincided with increased manufacturing and construction hiring last month and business investment accelerating this year. The University of Michigan’s gauge of consumer sentiment rose in August from July, ​and is trending near the highest levels since 2000. ​Friday’s jobs report showed August hiring slowed in the services sector, which had been a source of strength for this year. The slowdown included restaurant work, health care and temporary-help services, while government employment declined for the second straight month. The August hiring report won’t change the Fed’s immediate plans. The central bank is widely expected to initiate the slow runoff of its $4.5 trillion portfolio of bonds and other assets at its Sept. 19-20 policy meeting. But the report deepens a debate inside the Fed about how to respond to soft wage and inflation pressures. This dilemma could complicate the last big decision Fed Chairwoman Janet Yellen faces before her term expires early next year—how aggressively the Fed should proceed with interest-rate increases after it sets the balance sheet plan into motion. At their June meeting, Fed officials penciled in one more interest-rate increase for this year, which markets expect would happen in December. But officials have been puzzled by a slowdown in price pressures that have moved annual inflation gauges farther away from the Fed’s 2% objective. Ms. Yellen and other officials attributed the softness to one-off factors—price declines for wireless phone plans in March, for example, and prescription drugs in April. Inflation pressures have proved even more stubborn, with few signs of a rebound this summer. The Commerce Department on Thursday said the Fed’s preferred inflation gauge rose just 1.4% in July from a year earlier. Fed officials have been willing to look past softer inflation pressures because they expect a tighter labor market will ultimately force employers to raise wages and prices and because the economy is growing in line with its projections, and might even be perking up. Employers are still adding far more jobs than Fed officials expect is needed to keep up with population growth. Friday’s report doesn’t show a further decline in slack. 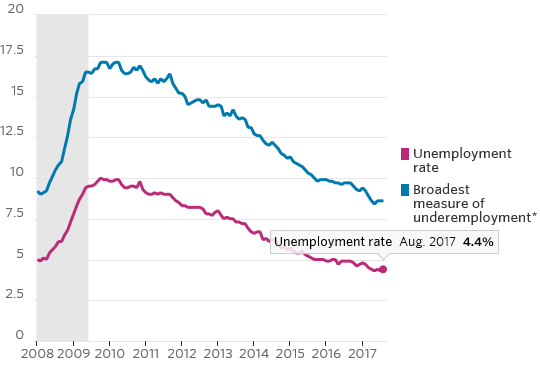 Gauges of unemployment and underemployment have held steady after declining earlier this year, and the share of workers 25 to 54 years old who have jobs declined in August. This takes a little steam out of the argument of hawkish officials that the Fed should raise rates again. Instead, it gives weight to dovish officials to press their case that labor markets have more room to run before the economy overheats. The wage gains are further puzzling because Fed officials keep seeing anecdotal evidence that labor markets are tightening in some industries and places. One example: Olean, N.Y., knife manufacturer Cutco Corp. It is struggling to attract workers to its factory in the state’s rural southwest corner. About 100 employees, or about an eighth of its workforce, have retired in recent years. To respond, the company is stepping up efforts to train local workers. It is also funding scholarships for older people in community, not recent high-school graduates, who want to return to school to gain skills to work at the factory. “We can still find and train people, but the population of this county is going down,” said Executive Chairman James E. Stitt. He is also responding by automating the plant. “We’ve got a lot of robots running right now,” he said. If the incoming data don’t paint a dramatically different picture from the past few months—steady economic growth and hiring with low inflation and wage growth—and the Fed sticks to its plans to raise interest rates, Ms. Yellen will face a tricky balancing act. She will face pressure to explain how officials reconcile interest-rate increases with inflation that has moved away from their target. Futures market traders put the probability of a Fed rate increase in December at 43% on Friday, up slightly from 39% on Wednesday, according to CME Group. That isn’t a substantial move and points to the uncertainty in the market about whether the Fed will proceed. Inflation isn’t the Fed’s only concern. If bond yields fall and stocks rise because markets don’t expect the Fed to stay committed to raising rates, easier financial conditions could heighten officials’ anxieties over financial instability, giving greater reason to stick with their rate-increase plans. ​The August hiring data do come with a caveat—for reasons that aren’t entirely clear to economists, the month’s result is typically revised higher. Further complicating matters, future data could be murky. Will the Fed turn the US into a Mad Max world? Never in human history has the world been so much in debt. Never in human history has the world economy relied on such a high level of credit. Never in human history has the world been more globalised. What happens if the credit generating machine that powers our economy slows down in a meaningful way? I want to highlight the subject with some questions. Almost all business transactions in the US rely on credit. What happens if credit dries up almost entirely? The next recession will be different from all previous ones due to the unprecedented high levels of debt. High indebtedness ruins credit, thus ruins the ability to borrow. Who will be left with enough credit to borrow when the downturn comes? If borrowing fails and cash up front becomes the norm, what part of the private sector of the US economy will survive? What company has the resources to pay staff and suppliers in cash? Banks will not lend if the counter party has no credit. Will the pledging of assets as collateral work if the market for selling the collateral will be gone due to a lack of funds? What will happen to the global banks that dominate the financial world if the lack of credit shuts down other nation's economies and the world economy as a whole? Massive rises in loan defaults would destroy their balance sheets. Governments and central banks can save them from collapse and keep them alive as zombie banks. Will this rekindle the bank lending that is needed to save the private economy? In such a scenario cash would be extremely valuable and central banks around the world would produce it in unlimited quantities to fight the crisis. In the US less than 25 per cent of all currency exists in bank notes and coins. How many months or years will it take to produce enough bank notes and coins for a cash based economy? Events could unfold so quickly that any plan to revive the economy will come too late. How many meals is a nation away from mass insurgency and revolution? Do you have enough dry food to survive for three months – a timespan that may be needed to restore basic supplies? What is the value of a Dollar if the private sector that produces the goods and services that back it has gone? If the shelves in the supermarkets are empty? If petrol stations have run dry of fuel because global trade has come to a halt? When the French army collapsed in 1940, petrol was only for sale for gold. Do you have any? Electricity is indispensable in today's world. What happens if power stations shut down because they have no cash to pay for the fuel they need to generate electricity? Can you imagine what a world without electricity will look like? Are your finger nails strong enough to scratch your Bitcoins off your hard drive? A collapse of credit is the trigger to a Mad Max scenario. What is the Federal Reserve doing in this context? They have sponsored this unparalleled debt bubble with their ultra low interest rate policy. Now they are on the path to prick it. Do they realise that they may be sending the US and the world economy back to the Dark Ages? How many rate hikes or board member grandstanding will it take to get Max Rockatansky into action? There is obviously always room for a miracle. Jesus has turned water into wine. I wonder whether the Federal Reserve management is vested with divine powers. Maybe they just change the model. I can imagine Janet Yellen turning wine into wáter. 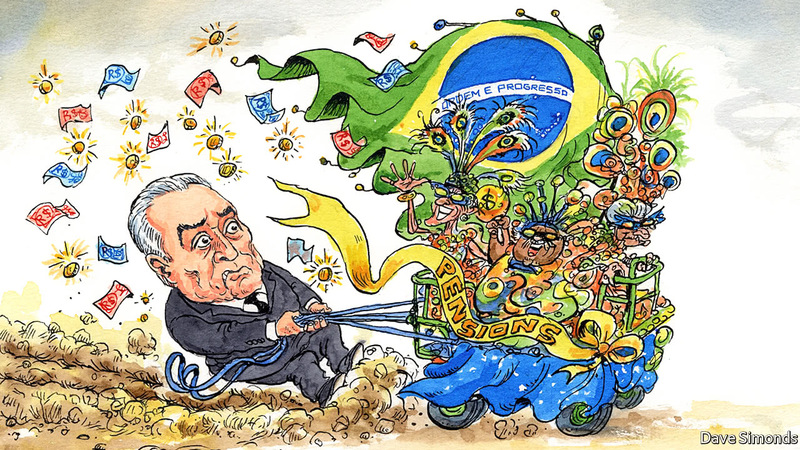 When will Brazil’s future arrive? AFTER a grinding two-year recession, the longest in Brazil’s history, a recovery has been slow to materialise. The IMF expects GDP growth of just 0.3% this year. The joblessness rate is 13%. Last year’s fiscal deficit, including large interest payments, was nearly 9% of GDP. Lower-than-expected tax receipts have forced the government to accept that for the next four years the budget deficit will be higher than planned. But markets seem unperturbed. The Bovespa, Brazil’s benchmark stock index, is back at levels not seen since May, when a leaked recording of the president, Michel Temer, apparently discussing bribes threw politics into chaos and put his future in doubt. The Brazilian currency, the real, strengthened by 6% in July. Some of the optimism is based on a conviction that after such a long slump, a rebound cannot be far away. Higher prices for commodities are helping: Brazil is a big exporter of many, including soya and iron ore. Interest rates, which were kept high throughout the recession to curb inflation, are falling. In July, despite his indictment on corruption charges, Mr Temer managed to pass a reform of labour laws that have long throttled growth. He is now trying to simplify a convoluted tax code that means a typical firm has to spend 2,038 staff-hours a year on compliance. But hopes for a robust recovery ride above all on Mr Temer’s promise to bring public spending under control. Last December he persuaded congress to agree to a 20-year real-terms spending freeze. For it to stick, however, he will have to reform a pension system that entitles Brazilians to retire, on average, at just 58. Pensions already cost 13% of GDP. Without an overhaul, government spending on pensions could reach a fifth of GDP by 2060, when the number of over-65s is projected to increase from 17m now to 58m. A measure setting minimum retirement ages of 65 for men and 62 for women had looked close to gaining the three-fifths majority needed in the lower house when the scandal involving Mr Temer broke. Some of his congressional support then evaporated. Markets took fright. “It was like a cold slap in the face, a reminder that this is Brazil,” recalls James McCormack of Fitch, a ratings agency. On June 26th, Mr Temer was indicted on corruption charges by Rodrigo Janot, the chief prosecutor. The Party of Brazilian Social Democracy (PSDB), Mr Temer’s largest coalition partner, is thought likely to back a renewed effort to rein pensions in. Though some of its deputies voted against him on August 2nd, most agree that the reform is necessary. It hopes to have a shot at the presidency next year, probably with either Geraldo Alckmin, a four-time governor of São Paulo state, or João Doria, the mayor of São Paulo city. The PSDB would prefer Mr Temer, who will not seek re-election, to be blamed for the unpopular measure. A lot depends on how much the reforms are watered down. Mr Temer had already conceded a more gradual raising of the minimum retirement age than originally envisaged, which had cut the potential savings over ten years by about a quarter. His weakened political position means more concessions will probably be needed, such as allowing rural workers to draw pensions earlier than had been intended, and further extending the transition period. The result may provide just half of the savings originally hoped for. That is worrying: even the original proposal would not have been enough to stop Brazil’s public debt rising, points out Mr McCormack. It is already above 70% of GDP, high for a middle-income country. Mr Temer’s position is not entirely secure. Mr Janot, who steps down on September 17th, is thought to be preparing to indict the president once more. Another source of danger is Eduardo Cunha, a former speaker of the lower house who was close to Mr Temer. He is co-operating with prosecutors in an attempt to reduce his prison sentence for corruption. If he implicates Mr Temer in wrongdoing, some of the congressmen who supported the president in the last vote might switch sides. Another question is whether the next president will continue Mr Temer’s reforms. The latest polls put Luiz Inácio Lula da Silva, a former president who oversaw a big increase in public spending, ahead of other likely candidates. He is followed by Jair Bolsonaro, a far-right congressman who admires the former military dictatorship. Neither would be considered market-friendly. It is still early days, but more is usually known at this stage about who will run for president. Mr Temer hopes pension reform may help salvage his reputation. But he is in a race against time. Congressional seats are also up for election next year. Deputies hoping to retain theirs will be too preoccupied by electioneering to get much done, reckons Fabio Giambiagi, a pensions expert. With each revision to the bill requiring a separate vote, “the window of opportunity is closing”, he says. Congress is also attempting to reform campaign-finance laws. A new law must be passed before October 7th if it is to come into force before next year’s elections. The markets are betting that Mr Temer, a consummate dealmaker, can gather enough support for his fiscal agenda. But that is far from certain.